Be the first to share your favorite memory, photo or story of Savannah. This memorial page is dedicated for family, friends and future generations to celebrate the life of their loved one. Mrs. Savannah Ann Cohen Oliver Hill, 88, of Blairsville, passed away Friday, February 8, 2019, at Union General Hospital in Blairsville. Mrs. Hill was born June 5, 1930, in Meriwether County, daughter of the late Marvin and Annie York Cohen. She was a retired executive secretary, had been an active community volunteer, and was a very giving person. She loved music and sang in her church choir and was a very avid Dulcimer player. 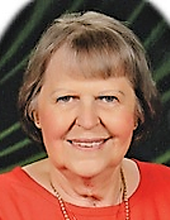 She and her husband traveled extensively in their RV all over the Western United States and in her senior years she even enjoyed tent camping. Survivors include her husband of 21 years, John O. Hill of Blairsville; sons and daughter in-law, Brian Oliver, Kenneth and Rhonda Oliver all of Luthersville; sister and brother in-law, Marybeth and Raymond Davenport of Luthersvill;, eight grandchildren, fourteen great grandchildren, three great-great grandchildren: several nieces and nephews. In addition to her parents, she was preceded in death by her brother, W. H. Cohen and her sister, Madelyn Scott. A funeral service will be conducted Monday, February 11, at Choestoe Baptist Church in Blairsville. The graveside service will be conducted at 1:30 p.m., Tuesday, February 12, at Bethel Baptist Church Cemetery in the Rocky Mount Community of Meriwether County, with the Reverend Winston Skinner officiating. The family will receive friends from 11:00 a.m. until 1:00 p.m. Tuesday at Claude A. McKibben and Sons Funeral Home. In lieu of flowers, memorial contributions may be made to Bethel Baptist Church Cemetery Fund, P. O. Box 755, Luthersville, GA 30251. Claude A. McKibben and Sons Funeral Home of Hogansville is in charge of local arrangements. To send flowers or a remembrance gift to the family of Savannah Ann Hill, please visit our Tribute Store. "Email Address" would like to share the life celebration of Savannah Ann Hill. Click on the "link" to go to share a favorite memory or leave a condolence message for the family.